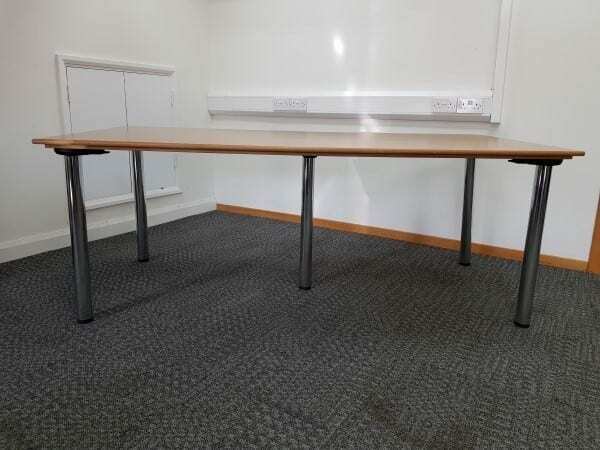 We currently have this fine looking Beech Meeting Table in stock and available for immediate delivery, you can view this product in more detail by clicking on the image(s) to the left hand side of this page. This products dimensions are : 2000 x 1000mm. If you would like to obtain some further information out about this products, then please contact one of our sales team by calling 07944 508282 for more information. Our sales team are available between the hours 9am to 5pm, Monday to Friday. If you are viewing our website on a Mobile Device, you can click on the Telephone Icon located at the bottom of this page as this will input our sales team contact number directly into your phone without the need of having to manually enter the number yourself. If you are unable to call us, or are viewing our website out of office hours, you can enter your details into our ‘Request a Quote Online Form‘ below and one of our sales team will be in touch to assist you further. If you were looking for a particular product that has a certain finish or brand name, we currently have an extensive range of Second Hand Tables available in stock at the moment and you can view all of these products by clicking on the link that has been provided in this paragraph. 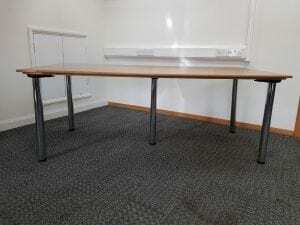 As always, these tables can be viewed in our showroom along with all our other used office furniture.